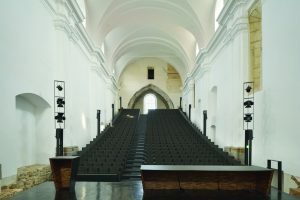 The great hall (former church nave) has two stages, upper and lower, allowing you to combine several performances at the event. The hall is equipped with great lighting, a sound system, and a video projector, which can all be managed from the control room. The control room is at the back of hall, and allows the technicians to see both stages. The lower stage has a backstage, where part of the technical equipment and other tools required for running events are installed, and which can also be used by the performers. 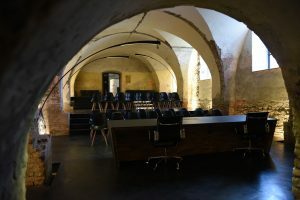 The small theater hall has a conference table with all the necessary sound equipment, as well as equipment for video projections. The seats in the hall are stacked in tiers, giving all participants a clear view of the stage. 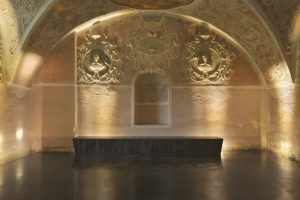 The old summer refectory is one of the best preserved monastery rooms, with beautiful Baroque plasterwork and murals. The room has a conference table and all the necessary audio-visual equipment. 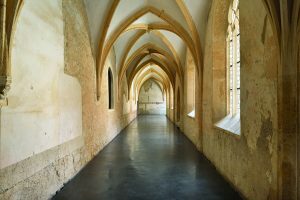 The cloister is the most aesthetically and artistically significant part of the monastery. The quadrilateral hall, with its tall Gothic windows with lavish tracery, high arches, and exceptional Late Gothic plasterwork, is the ideal venue for receptions, exhibitions, fashion shows and other events where aesthetics matter. The inner courtyard is surrounded by the cloister on all four sides. The contemplative atmosphere is perfect for intimate and small events. This small courtyard overlooking Drava offers astounding views of Haloze hills and Donačka Gora mountain. A stage is located on the western side, and food and drinks can also be served at the venue.